We are thrilled that Africa First's Artist in Residence, Sadikou Oukpedjo is exhibiting in Tel-Aviv, together with Israeli artist Sharon Pazner ! Sadikou Oukpedjo, Amure 1, 2018, Mixed Media on Canvas, 135 x 125 cm. Sharon Pazner's works echo her training as an architect – albeit a laboratory architect. She casts miniatures that function as cognitive structures. These structures are liberated from schematic and systematic thoughts, which characterize the architect who seeks constructive solutions. As in any lab experiment, Pazner begins with a hypothesis: based on the fact that clay and concrete are antagonistic, she assumes a disasterous end-result. Nevertheless, she sets out on a Sisyphean journey bound to end in broken promises. For the outside observer, the journey cannot but lead to failure. For Pazner, the process is paramount and the perfect result is not the purpose. With eyes open wide, she insists on observing the rejection, exposing the fracture, at times even rummaging through it and then presenting it as such – fragile and weak from struggling. Pazner chooses to use seemingly plain materials in her work– concrete, clay, nails and pins. She then diverts them from their ordinary industrial use. Her practice disconnects from any artistic continuity and assesses the veracity of the assumption that some materials are not meant to coexist. Pazner explores the materials; she brings them together and seperates them apart. Through this process, she reveals a mutual recognition that is found through struggle, rupture and rejection. Even as the concrete resists other materials, it reaches out for contact, it converses, and it acknowledges the other. At that point, the cracks that reveal themselves are seen in both their beauty and ugliness, as a present existential situation. When the material is resistant and insists on retaining its elementary properties, it collapses, leaving behind the telltale remains of a lost struggle. In her previous works, Pazner served the viewers petit fours and children’s toys, which she made of concrete and decorated with rusty nails and glass splinters. Her current exhibition continuous her interest in sharp, rusty materials, but this time courageously addressing the difficulty of connecting or coping with rejection. Pazner works reveal that underneath the intractable concrete, among the rusty nails lie circular, soft shapes. And in softness, even when it is thorny and surrounded by walls, there is acceptance and containment, a willingness to cope with what seems to be impossibly daunting. 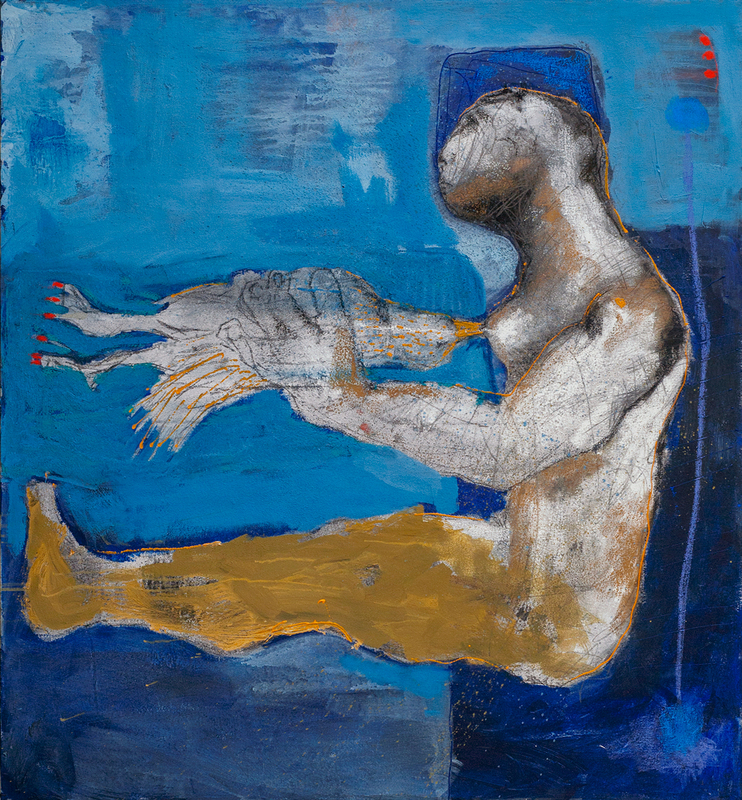 Sadikou Oukpedjo, Pelerinage, 2018, Mixed Media on Canvas, 125 x 135 cm. Sadikou Oukpedjo acquired his professional training in the studio of Togolese artist Paul Ahi, where he specialized in sculpting and drawing. There, he delved into the recesses of local artistic heritage in order to apply it in his own work. Today, Oukpedjo claims, his art is completely detached from Togolese or West-African traditions. He therefore entitles himself to create a universal epic on the belligerent confrontation between Nature and Humanity. Like other mythmakers before him, Oukpedjo gives meaning to existential conditions. Unlike them, his epic tale is plotless and has no protagonist or victors. 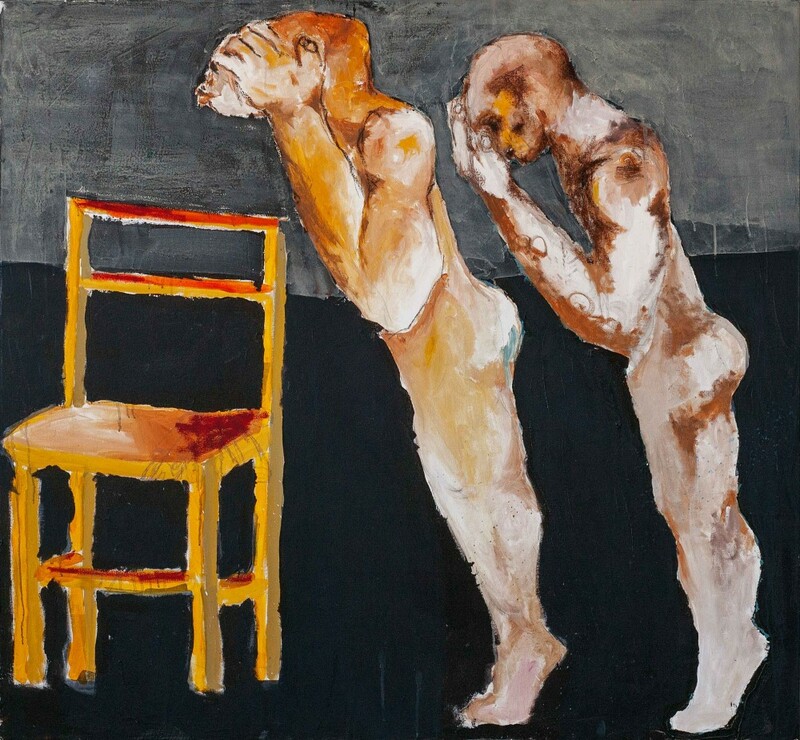 The only recurring motif in Oukpedjo's works is the struggle between humans and animals. Paradoxically, the forced detachment from his original culture does not leave him disconnected or in a constant search for roots. Instead, it allows him to simultaneously connect to a time-honored European romantic tradition, as well as to African mythologies that address similar confrontation. 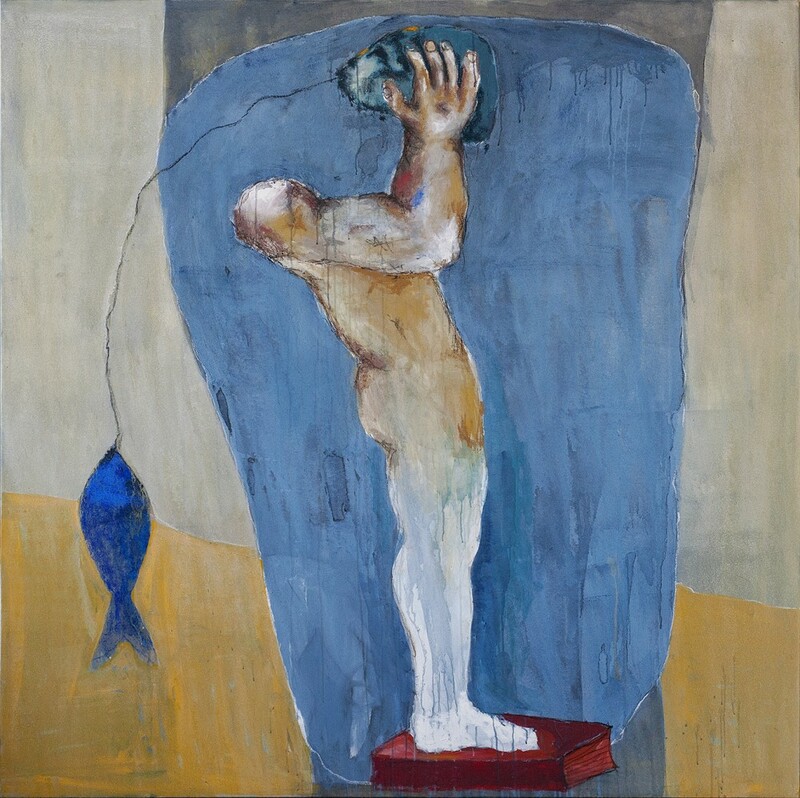 The depicted struggles in Oukpedjp's paintings produces hybrids – a fish with a human foot for a tail, an animal-headed man, or other dissected mutations. The hybrid characters create a dramatic effect that inheres passion and violence, yet unlike other mythologies, Oukpedjo does not wish to offer a moral to the story. The artist refuses to give explanations of his work and leaves the viewer in a realm of endless inquiry and questioning. Oukpedjo's varied coloring techniques and changing finishing levels reinforce the deceptive shifting between completeness and incompleteness, leaving room for a flexibility of the imagination. The sense of suspended completeness betrays disorder yet hold the possibility for change. The dissection of the heroic, mythic body of both African and European cultures embodies the ability to start anew, to structure a more equal footing in reality. In many cultures, pairs of opposites are seen as a unifying vital force. In many artworks, the harmony is produced by opposites, or alternatively, dichotomies disrupt the order of the familiar image, inviting the viewer to reexamine and thereby interpret the uninterpretable.